Dobbs did not play in Sunday's 16-13 win over Cincinnati. Analysis: After watching from the sideline his rookie season, Dobbs played in five games in 2018, taking a total of 30 snaps. He finished completing five of 12 passes for 43 yards with one interception. His passer rating of 24.0 was the worst in the league of anyone attempting 10 or more passes. Dobbs has two years remaining on his current contract but may again find himself in a battle with Mason Rudolph for the backup quarterback job heading into next season. Dobbs completed four of nine passes for 24 yards and an interception during Sunday's 24-21 loss to Oakland. He also ran for 15 yards on two carries. 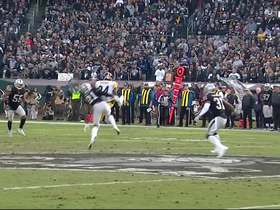 Analysis: This was the first extended look at Dobbs in a game that counted, and he was unable to do much of anything against a Raiders defense ranked 31st in the league in points allowed. Pittsburgh failed to put any points on the scoreboard during the four offensive series Dobbs played in place of Ben Roethlisberger (ribs) before Big Ben returned in a failed attempt to avoid a third consecutive loss. Expect Dobbs to be back to holding a clipboard in Week 15 against New England. Dobbs completed one of two passes for minus three yards during Thursday's 52-21 win over Carolina. 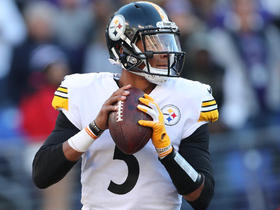 Analysis: The second-year quarterback relieved Ben Roethlisberger with the game well in hand to play the final two offensive series, the second of which he didn't even attempt a pass. He looked like what one would expect from someone who has attempted just three passes in his career, but is still the leading candidate to take over the Pittsburgh offense if Roethlisberger were to get hurt. Oakland Raiders linebacker Tahir Whitehead intercepts Pittsburgh Steelers quarterback Joshua Dobbs. 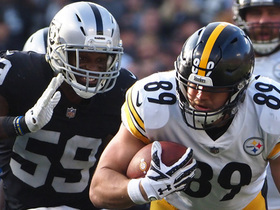 Oakland Raiders linebacker Tahir Whitehead stops Pittsburgh Steelers tight end Vance McDonald on fourth down. 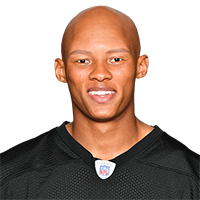 Pittsburgh Steelers quarterback Joshua Dobbs finds wide receiver JuJu Smith-Schuster for 12 yards. 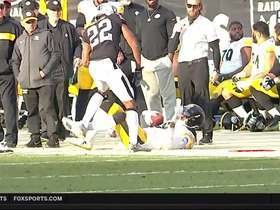 Pittsburgh Steelers quarterback Joshua Dobbs lasers 22-yard pass to wide receiver JuJu Smith-Schuster.